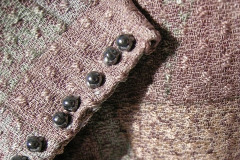 I am continually amazed and delighted with Japanese kimono fabric. The word “kimono” means clothing in Japanese. So a kimono fabric might be meant to make a komon kimono, a haori, an obi, or some other item of clothing. The one thing that all kimono fabric has in common regardless of its fiber content or intended use, is its narrow width, which is between 13” and 14”. This narrow width is both a challenge and an inspiration to me as I use kimono fabric to design and make beautiful scarves, clothing, home décor and jewelry. Many of the silk bolts have a woven pattern. The Japanese term for this is rinzu. 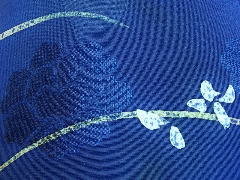 Some silks have a textured background with raised motifs at intervals. 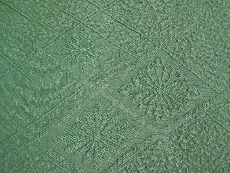 This green silk has diamonds with chrysanthemums in the center. Some silks have an overall pattern. This is a very strong overall rinzu pattern which is surprisingly soft texture. The dyes of muted green, gold and mauve geometric shapes create added interest. Shibori is almost always done on rinzu fabric. Here you can see the bamboo stalk that has been woven in the fabric. 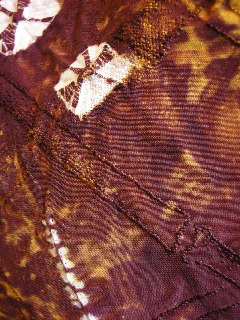 Shibori is a resist dyeing technique which has created the white areas on the silk. 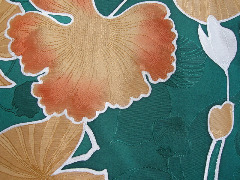 Occasionally I find a silk on which the dye follows the line of the woven rinzu motif, as in this piece. The orange and gold dye follows the white outlines of the leaves. I don't yet have anything made with this silk on my Etsy shop. Click here to order handcrafted silk kimono accessories.